According to Dr. Spencer in his History of Kentucky Baptists (Vol. I, page 581), "The Baptist denomination of Kentucky was never more prosperous than in the year 1820, (just before Boone's Creek Association was constituted.) The churches and associations were enjoying great peace, if we except one or two slight interruptions. The spirit of missions had been greatly revived and churches were contributing more liberally to foreign missions than those of any other portion of the United States; they had at this period a corps of ministers, who in all the elements of success ranked favorably with any on the continent." Among the list of the eight preachers named by Dr. Spencer is one that Boon's Creek Association loves to honor, namely, Dr. William Vaughan, for he was a product of that Association. He was a noted infidel at Winchester Kentucky before his conversion, after which he became a great preacher and theologian, and it is doubtful if he had a superior in Kentucky. But soon after the period of 1820, the anti-mission spirit began to develop, and Elder Alexander Campbell began his preaching in Kentucky, although the doctrine which he preached had preceded him to the State, and he soon had many followers, even from the Baptist churches. It was during this period that Boone's Creek Association was constituted, and even as early as that we can see the efforts of Campbell bearing fru1t within the territory of Boone's Creek Association, for in one of the preliminary meetings looking toward the constitution of that Association there was inserted in the proposed constitution a clause that the Lord's Supper be observed on the second day of the Association. As a result of the firm stand taken by Boone's Creek Church in opposing that objectionable clause, it was eliminated from the constitution. (See Boone's Creek Church). was chosen moderator and William Boone clerk of this meeting. The messengers present agreed that it was desirable to organize a new association, but adjourned to meet again on the 2nd day of October, 1822, at Boone's Station, in relation to the same business. (See account of this meeting under Boone's Creek Church). According to appointment the messengers convened at Boone's Station on the 2nd day of October. A committee was appointed to draft a constitution and report next day. On the next day, October 3rd, the committee reported a form of constitution and rules of decorum. The conventlon adjourned to meet again at Bogg's Fork Church on the 25th day of April, 1823. The prepared constitution was sent to the several churches which underwent considerable alteration in all the churches, except the First Baptist Church of Lexington, who wished it to stand unaltered. The messengers from four churches (the First Church of Lexington not represented), met at Boggs' Fork Church on the time appointed, and a constitution was agreed upon on the second day of the convention, April 26th, 1823. The convention then appointed the 28th day of May, 1823, as the day to be constituted. On that day messengers from Mt. Gilead, Boggs' Fork, Hickman and Boone's Creek Churches met at Mt. 'Gilead Church, Fayette County and elected Jacob Creath, moderator and William Steerman, clerk. Other ministers present were J. Vardeman, John Smith, J. Collins, Thomas Boone and James Quisenberry. The constitution as previously adopted by the churches, was read and again sanctioned by the messengers as their constitution. This constitution has never been altered during the hundred years existence as an association except one slight change in Article 15, made at the annual session of the Association in the year 1922. "Certificate of organization, May 28th, 1823: This is to certify that having been called upon by the churches of Boggs' Fork, Boone's Creek, Mt. Gilead an Hickman to officiate as a presbytery in the constitution of an association composed of their members whom they have chosen for that purpose, in pursuance therewith we have this day met at Mt. Gilead, in Fayette County, Kentucky, and after the necessary inquiry and examination, proceeded to constitute an association called Boone's Creek. Given under our hands this day and date above, Jacob Creath, William Steerman." The association then elected Elder George G. Boone moderator and Elder B. W. Riley clerk. Rules of decorum were agreed upon and correspondence opened with Elkhorn, Tate's Creek, North District and South District Associations. The membership of the Association was 400. The next meeting was in September 1823, Elder Richard Morton moderator, B. W. Riley clerk. Providence, Mt. Union and Hind's Creek were received at this meeting. No further mention will be made in the body of this article of the names of officers of the Association or preachers who delivered the introductory sermon, except in a few instances, as this information will be found in the Historical and Statistical Table at the end of the article. Nicholasville Churches were added to the membership. Mt. Zion and Liberty Churches joined the Association in 1826, and Indian Creek Church was received in 1827. At the latter session the total membership was 985. The Association met with Friendship Church at Winchester, Kentucky, in 1828, and at this time it was composed of thirteen churches, with a membership of 1,835. It seems that nearly all the churches had large ingatherings during that year, as the minutes show that there were 869 baptisms. This large increase in numbers was also very noticeable [sic] in other associations, especially in the northern and middle portions of the state, particularly where the followers of Mr. Campbell preached "baptism for the remission of sins." Dr. Spencer says: "It is to be feared that a majority of those baptized during this revival were not converted in the Baptist definition of that term." It only hastened the day of separation between the Baptists and Reformers, many of the latter having membership in Baptist churches and affiliating with Baptist Associations. "Resolved, That we the churches of Jesus Christ believing the Scriptures of the Old and New Testament to be the Word of God, and the only rule of faith and obedience given by the great head of the churches for its government, do agree to meet annually on the 3rd Saturday, Lord's Day and Monday in September of each year for the worship of God and on such various occasions voluntarily communicate the state of religion amongst us by letter and messengers." This resolution was brought about by the influence of Elders "Raccoon" John Smith, Jacob Creath, Jr., and William Morton, all three of whom had preached at this session of the Association and were strong advocates of the doctrine of Elder Campbell, yet affiliating with Baptist churches and associations. Likewise through their influence was the following motion carried: "On motion agreed after preaching on the Lord's Day to unite with the church at this place and our brethren generally in participation of the Lord's Supper." This is the only recorded instance of the Lord's Supper being observed at a session of Boone's Creek Association. Little by little the storm grew until it became of such magnitude that it swept down upon Hind's Creek Church, in Madison County, in September, 1829, where the Association was in session, and sank six out of thirteen battle ships of Boone's Creek Association in the sea of baptismal regeneration. When the resolution referred to above was put to a vote, the churches of Friendship, Nicholasville, Lower Bethel, Mt. Zion, Liberty and Mt. Union voted to abolish the constitution of the association. The next annual session was held with Indian Creek Church in 1830, when seven churches, namely, Mt. Gilead, Boggs' Fork, Providence, Boone's Creek, Hickman, Indian Creek and Hinds Creek, reported a membership of 739. At the session of 1831, Ambrose Bush was elected moderator for the first time, and was afterward honored with that position for nineteen consecutive years. He was a son of Ambrose Bush, Sr., one of the five Bush Brothers who came from Virginia in 1780 with the "Travelling Church," now Providence Church, Clark County. (For note on Ambrose Bush, see Boggs' Fork Church). During the period between 1830 and 1840, the Association increased but very little in membership, even with the addition of one church, Mt. Freedom in 1832. In 1837, is the first mention made of foreign mission work, when the Association took up the request that they aid the American and Foreign Bible Society in sending the word of God to the heathen, and adopted the following: "Resolved, that this Association believes the Bible cause to be the cause of God * * * * we therefore recommend to the churches composing the Association to take the matter into consideration and report their views on this subject and send their subscriptions and contributions to our next Association to aid the Society in its operations." (See Mt. Freedom Church). Again, in 1840, the Association adopted the following resolution: "The word of God plainly indicates the duty of the Baptist denomination to give a faithful translation of the sacred Scriptures to every heathen nation without delay." The first treasurer of the Association, Samuel Chom, was elected in 1848, and was to receive money from individuals and churches for missionary purposes, eight dollars being contributed at this meeting. In 1849, the Association, for the first time, sent a letter and messengers to the General Association of Kentucky, which met at Lexington. The sum of $40.45 was sent to the General Association at this time. In 1843, the Association appointed a committee to employ a missionary to work within the bounds of Boone's Creek Association. This is the first recorded effort for a missionary in the Association. During this period there had been 656 members received into the churches by experience and baptism. During the period between 1850 and 1860, two churches were received, namely, Union City, in 1858, and the First Winchester Church in 1859. The total membership of the Association remained about the same during this period, although there were 487 baptisms reported by the churches. Elder B. E. Allen became quite an influential member of the Association about this time, and was moderator every year during this period with the exception of one, and had been clerk for several years prior to this date. (See Boone's Creek Church). The Executive Board was created in 1852, and $43.00 was pledged by messengers, and the pastor's pledging 85 days preaching in the destitute field of the Association. From 1860 to 1870, which included the period of the Civil War, the Association seems to have retrograded some, both in numbers and activities, but since that time it has gradually increased both numerically and in the advancement the various objects of the denomination. Elder B. E. Allen, a faithful member and for a long time an officer, was called to his reward in 1861, and the follow abstract is from the resolutions upon the records of the Association: "Resolution that in the death of Brother Allen the church and the Association have lost all that could be comprised in a good and honest man, an able and beloved minister, &c." (See Boone's Creek Church). Bethel was received in 1868, During this period Sunday Schools began to be organized in some of the churches for first time, as many as eight being reported in 1868, but it was some years after this before any Sunday School statistical tables were placed in the minutes of the Association. The period from 1870 to 1880. For half a century prior to this period, the annual sessions of the Association were largely taken up with much preaching, of which there were two, three and sometimes four, sermons to the same audience, following each other in immediate succession, especially in the first quarter of the century. The correspondent and circular letter, the latter being sometimes doctrinal, and at other times practical, seemed to be an important feature at the annual meetings. About the beginning of this period there began to be noticeable [sic] change in the programs of the annual sessions. The reports and discussions of colportage work, Sunday Schools, missions and benevolences became the important features of the annual sessions of the Association. At first committees were appointed at the annual meetings to report on the different subjects during that meeting, but later the committees were appointed at the annual session to report at the next, which still remains the custom of the Association at the present time. The various objects of the denomination demanding attention and support of the Association of Churches having greatly increased, there was not so much preaching at the annual sessions during this period as formerly, and after this period the custom of reading circular letters to the Association largely disappeared. pure conscience and worthy of double honor, gaining to himself a good standing and great boldness in the faith which is in Christ Jesus." Judge Frank S. Allen was moderator two years during the latter part of this period. (See Mt. Olive Church). Born May 20, 1823; died February 13, 1900. The period of 1880 to 1900. During this twenty year period, the Churches made some advancement along most of the lines of church activities, more noticeably [sic] in the Sunday School work, all of the thirteen churches, with the exception of four, reporting Sunday Schools. The total church membership had doubled. Four churches were received into the Association, namely, Powell's Valley in 1883, Allansville in 1888, Beattyville in 1894 and Filson in 1899. Born December 7, 1836; died January 25, 1918.
no wavering, no doubting, his faith was fixed, and in all matters pertaining thereto he was uncompromising. * * * * A strong man in Israel has fallen, and we shall miss his voice and his counsel in this our Association. 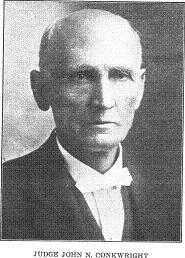 The Western Recorder of February 7, 1918, in speaking of Judge Conkwright says: "He was an intense and uncompromising Baptist, and to him more perhaps than to any other man is due the large number of stalwart Baptists in Boone's Creek Association. He was ever ready to contend, but never to apologize, for the once delivered faith." W. D. Strode was elected clerk In 1886, and served for twenty consecutive years. In the same year there appeared for the first time in the minutes of the Association a financial statistical table of the churches, which showed that $3,967.05 was the total amou[n]t given by all the churches for home expenses and missions, although the churches had been giving to missions through agents for years. Today the total is twenty times that amount. At the present time there are three or four churches whose contributions exceed annually the total amount of all the churches in 1886. At the same session, in 1886, the Association adopted the plan suggested by the General Association of Kentucky for the raising and disbursement of all funds for missions and benevolences. 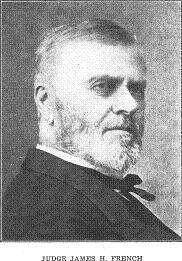 In 1897, the Association adopted the following resolution, there being only one dissenting vote: "Whereas, Dr. W. H. Whitsitt, of the Southern Baptist Theological Seminary at Louisville, Kentucky, has published to the world that prior to 1641 all Baptists practiced sprinkling and pouring as the mode of baptism, and that immersion was invented in 1641, and, Whereas, the publication of such views has resulted in such serious division as to threaten the disruption of our denominational enterprises, therefore, be it Resolved, that the peace and harmony of the cause of Christ are of more value than the position and reputation of any man; and that it is the sense of the messengers and members of the Boone's Creek Baptist Association that Dr. Whitsitt be asked by the Trustees of the Seminary to resign his position as President of that Institution and also his professorship in the chair of Church History, and that the support and encouragement of the Baptists be withheld from the Seminary until his resignation shall be received." During the period from 1900 to 1923, especially toward the latter part, advancement along all lines of church endeavor is very noticable, particularly in the Sunday School, Women's Missionary Society and B. Y. P.U. work. There were eighteen in Sunday Schools reported out of twenty-one churches that composed the Association in 1922, the schools having an enrollment of 2,278. The home expenditures amounting to $1,649,22. Seven churches reported W. M. U. Societies, with a membership of 243. At the session of the Association in 1902, the following resolution was adopted: "Whereas, It has been announced that a prize fight for championship will be fought in Louisville, Kentucky, on September 22, and, Whereas, This same fight has been driven from other states, therefore, be it Resolved, 1st, That we join our voice with that of our brethren and others in protesting against having the prize fights on the soil of Kentucky. 2nd, That we call upon the authorities to go the full limit of the law to prevent this disgrace coming upon our beloved State. 3rd, That a copy of these resolutions be signed by our moderator and clerk and be sent to the Govornor [sic] of Kentucky and to the Mayor of Louisville." disfavor and resentment on the sentimental gush that is winked at by some claiming to be Baptists, looking to an amalgamation of the churches of Jesus Christ which hold to doctrines and practices unknown to the word of God as believed and taught by our Baptist ancestors running back to apostolic age. God help us as an Association to inquire for the old paths and to continue steadfastly to walk in them. * * * * May the Lord keep Boone's Creek Association from falling into the error of amalgamation and alien immersion brethren." At the annual session or 1912, the Association earnestly and solemnly put herself on record as believing the divine law in regard to the marriage vow, and owing to the growth of the divorce evil, adopted strong resolutions against the evil. In 1915, the Association agreed that the annual sessions shall be two instead of three days, as has been the custom since her constitution in 1823. The Southern Baptist Convention, in May, 1919, launched a five year campaign for $75,000,000. The apportionment of that amount for the Baptists of Kentucky was $6,500,000, of which amount $200,000 was the apportionment for Boone's Creek Association. At the annual session in September, 1919, the Association accepted the apportionment of $200,000 without a dissenting vote. This amount was apportioned among the nineteen churches composing the Association at that time. During this last period, fourteen churches were added to the Association, but also during the same time five or six churches have dissolved or ceased to report to the Association, and one was granted a letter to unite with another association, so that at present the Association is composed of twenty-one churches with a total membership of 3,163, the largest in her history, and a total contribution for all purposes of $66,974.81, in the year 1922. (See financial statement of missions, etc.) Boone's Creek Association is now the seventh Association in missions and benevolences in the state of Kentucky.